With a stay at Clinch Self Catering in Durban North, you'll be next to a golf course, within a 15-minute drive of Sahara Stadium Kingsmead and Umhlanga Rocks Beach. Free self parking is available onsite. With a stay at Nibela Lake Lodge in KwaNibela, you'll be 17.8 mi (28.7 km) from Phinda Private Game Reserve and 23.8 mi (38.3 km) from UMkhuze Game Reserve. Free self parking is available onsite. 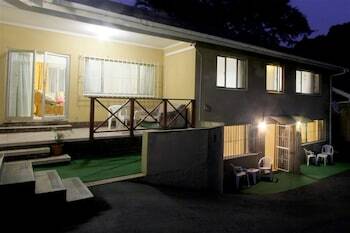 When you stay at this apartment in Knysna, you'll be within a 10-minute drive of Knysna Quays and Pledge Nature Reserve. Free self parking is available onsite. With a stay at Muizenberg Guestique in Cape Town, you'll be near the beach, just a 5-minute walk from Masque Theatre and 7 minutes by foot from Muizenberg Beach. Free self parking is available onsite. When you stay at Ex Deo Erdvark Cottage in Marloth Park, you'll be within a 5-minute drive of Lionspruit Game Reserve. Free self parking is available onsite.